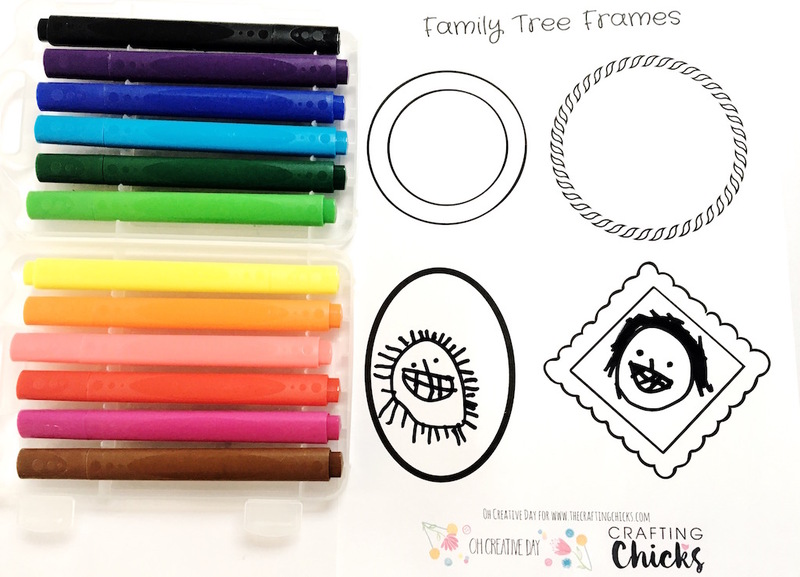 Make Your Own Family Tree with these adorable free printable frames. 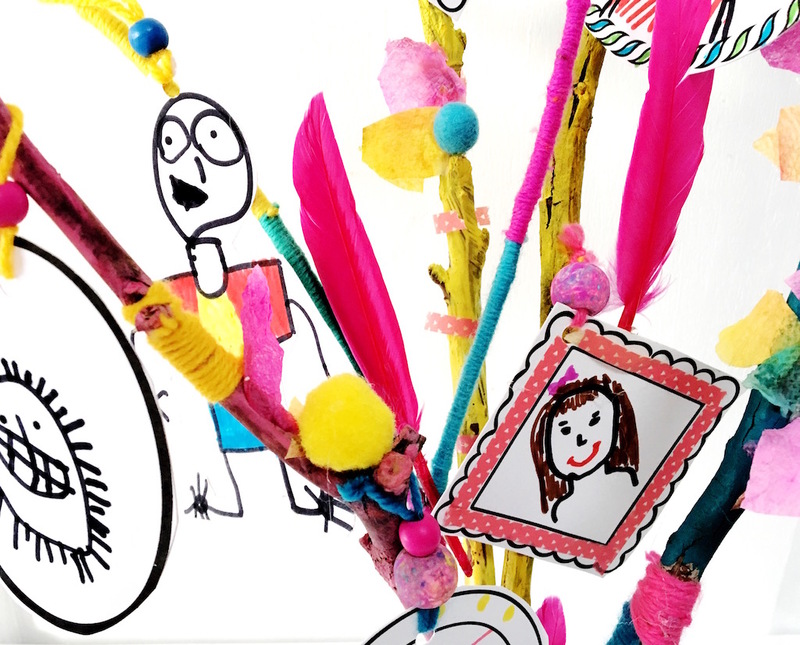 Take your Family tree to the next level with this fun branch DIY. 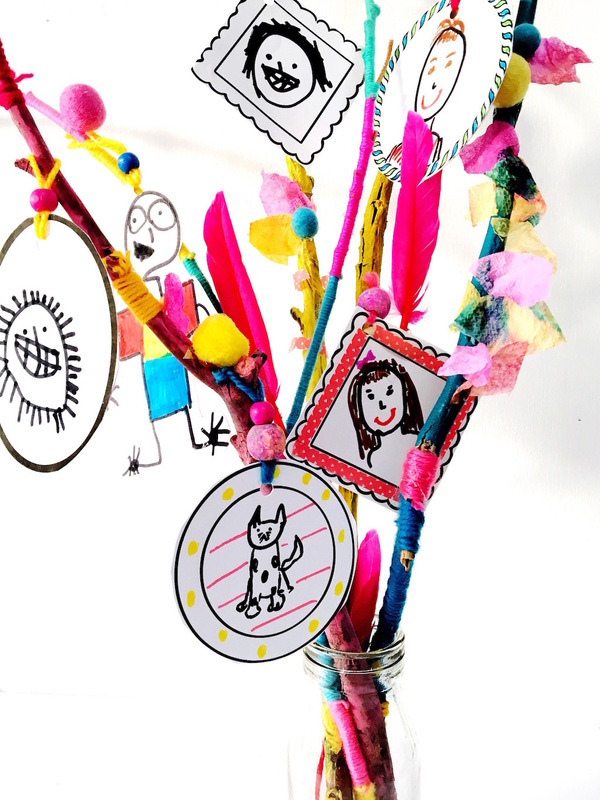 Make your own family tree with this project that is filled with different arty and crafty processes adaptable to all ages. It’s the kind of project that could fill a morning, or be spread over several sessions. If your children are anything like mine, no trip to the park is complete without bringing home a collection of sticks. “You guys, what are we going to do with. all. these. sticks?” I ask. “We’ll think of something,” tends to be the reply from my eldest. So step one involves going on a trip to the park, or on a neighborhood nature walk, and collecting a nice bouquet of sticks. These sticks will form the “trunk” of your family tree. Time to decorate those sticks. You could choose to paint the sticks. We used acrylic paints. A tip is to place the sticks inside a box. Painting inside the box contains the mess. For older children, let them try their hand at yarn wrapping. Tie the yarn on and wrap it round and round the stick. It’s surprisingly meditative stuff! 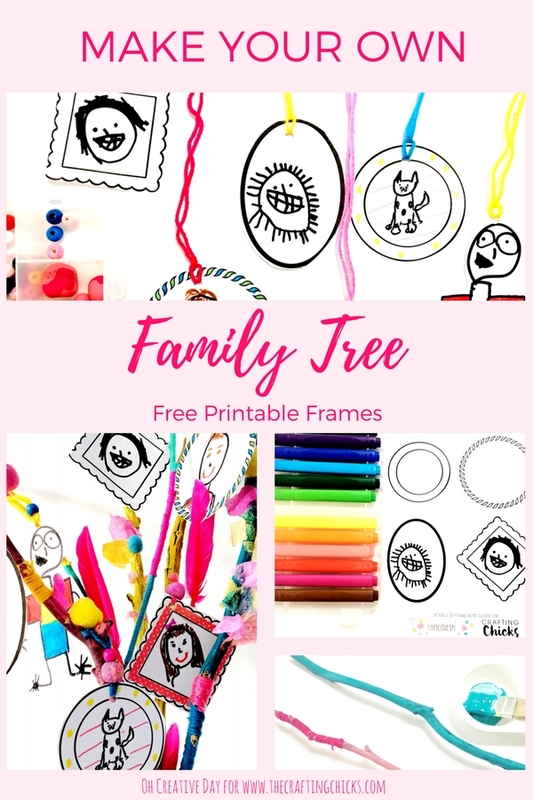 Print off the Family Tree Frames. Have each family member draw a self-portrait in the frame. Or mix it up and have family members draw each other. Once the portraits are complete, cut them out and punch a hole through each portrait. String some yarn through. We chose to thread some beads onto the thread. Great for some extra fine motor practice. 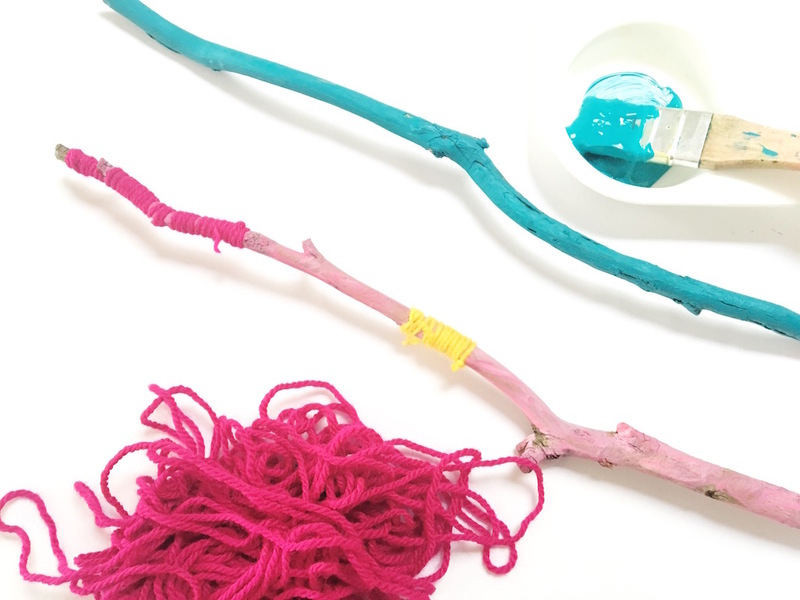 If you are working with younger children, you might consider using coloured pipe cleaners instead of yarn. Pipe cleaners are much easier for little hands to work with. Arrange your decorated sticks in a jar or vase. Hang your portraits on your family tree. We subscribe to the crafty philosophy of “more is more” in our family. So at this point, you have full permission to raid your craft supplies and embellish your family tree with whatever pleases you! Perhaps you could add some painted newspaper flowers? We added pom poms, feathers and paper towel leaves to our tree with a hot glue gun. Download Below. Personal Use Only Please. 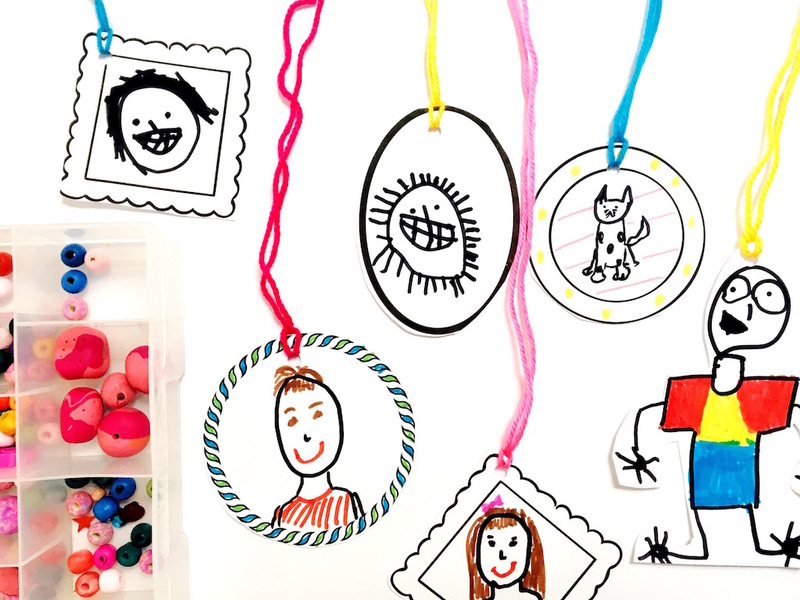 You can find more time-saving tips on arts and crafts with children here.